The first time I cooked a whole fish was when I caught a lake trout in Arizona. It was so hot in our small vacation rental kitchen that I figured it would be best to grill the fish outside. It was a fairly large fish. One of my traveling companions gutted and cleaned the fish (thankfully). We left the head on. It was so fresh, so why not enjoy those delicate cheeks. I was afraid of charring the skin and undercooking the flesh by cooking it directly over the coals. So, I stuffed the fish with aromatics, butter, and lemon, wrapped it in foil with a few holes poked in the foil, and placed it offset from the coals to essentially smoke. The meat was flaky and moist. The skin was a little smoky. There wasn’t a piece leftover. In the recipe developed here for a Masterbuilt Electric Smoker, I used the same concept with a few modifications. The fish is gutted, cleaned, stuffed, and placed on a foil raft so it won’t stick to the rack and so the smoke permeates the flesh. It is cooked low and slow. With super fresh fish there is really no need to brine or cure, just season generously. Remember to ask your fish monger exactly how fresh the fish is. Look into the eyes to see that they are bright and clear. Smell the fish. There should be no fishy odor. 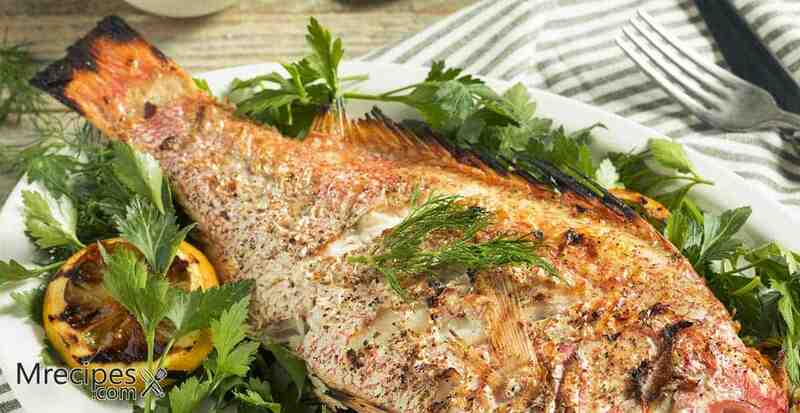 You can easily double this recipe to do 2 whole snappers in your smoker. I like to serve this with a chimichurri sauce that is rich in herbs alongside some smoked smashed red potatoes. 1. In a medium bowl, mix together the butter and EVOO. Add the salt and pepper. Slice the fennel, onion, and lemon. Reserve some of the leafy fennel fronds. 2. Prepare your smoker by adding wood chips to the tray and water to the bowl. Preheat the smoker to 225˚F. Open the top vent. 3. Generously coat the inside and outside of the fish with the butter and EVOO + salt and pepper. Stuff the cavity with the fennel slices, onion, fennel fronds, and half of the lemon slices. Place the fish on 2 sheets of aluminum foil. Turn up the edges of the foil to hold the moisture in. 4. Place the fish on the foil raft inside the smoker on the middle rack. Cook for 3 to 4 hours until the internal temperature reaches 145 to 150˚F. This is approximately 45 minutes per pound of fish. 5. You can serve the fish whole or place it on a cutting board and fillet it, removing the backbone and any pin bones. Serve it on a platter with chimichurri sauce and smashed potatoes. 1. Take the upper rack of the smoker out before putting the snapper in. Using a fork, poke a few holes in the skin of the potatoes. Rub them generously with EVOO, salt, and pepper. 2. Place the potatoes on the top rack of the smoker when the snapper has already cooked for 1 hour and 15 minutes. Set a timer for 60 minutes. Rotate the potatoes and continue to smoke until tender, approximately 45 minutes longer. If not tender, smoke for another 15 to 30 minutes. 3. Smash the potatoes rustically with the butter, not mashed. Serve with the fish and a drizzle of the chimichurri on top.